We already have the facilities to add and edit impulses, within the Organisation menu option. Select the Add Impulse link and fill in the details. The key field is the BCM Pin. This obviously needs to be the pin that your switch is connected to. The controller is constantly monitoring impulse configurations in the database, in order to set up the necessary event callback hooks. The next step is to monitor the event queue on the website Statistics page, while pressing the impulse button. As mentioned earlier, debouncing may not be sufficient defence against noise, so the controller code employs an additional lockout mechanism which prevents repeat events within 10 seconds of a button press. The main scheduler module is already optimised to keep a lookout for rules, and to process actuators, so the overall effect is that there should be reasonable response to pressing an impulse button. The event queue is the place to track impulse events and make sure you are getting the expected results. As with Conditions, Impulses won’t be processed until there is a connected Rule and Action. Make sure you use the toggle_actuator Action Function for impulses, to get the push-on-push-off behaviour, unlike the action_actuator used previously for Conditions. 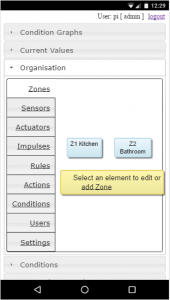 Impulses will appear as a clickable icon on the Current Values page of the website, within the Zone of their linked Actuator. 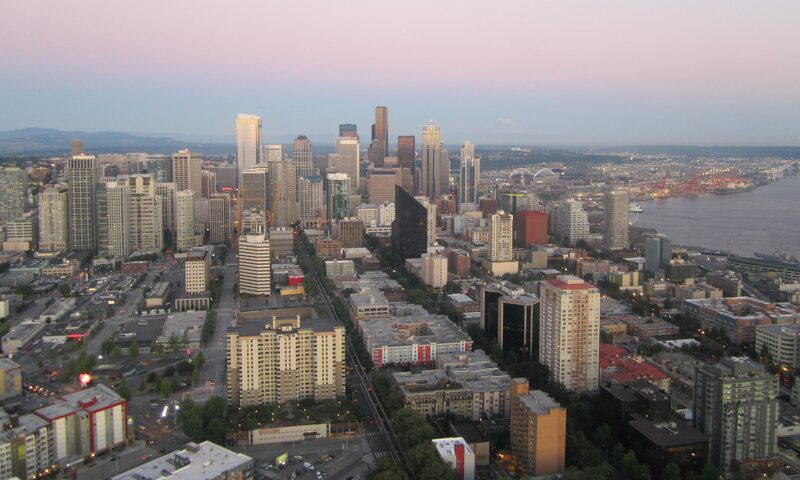 There is only one topic left on our project plan to implement – Statistics. This is covered in the next post. One of the design goals for the home-hub was for it to replace the traditional central heating programmer. I have never found these easy to work with, often tucked away in awkward locations, and had the picture in my mind of reclining on the sofa -tablet in hand – adjusting the programs. I will describe the process of interfacing the hub with a central heating programmer in a later post. You can choose from Daily, Weekdays or Weekend programmes. All that is required is to connect this Condition up to an Actuator Action via a Rule and you can switch devices on schedule. The next post will introduce the concept of impulses. 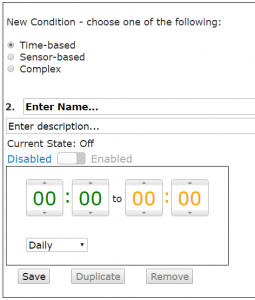 This provides the menu option to allow you to add add and edit simple Sensor Conditions, Time-based Conditions and Complex Conditions. This is a more user-friendly interface which is applicable to all hub users, not just administrators. 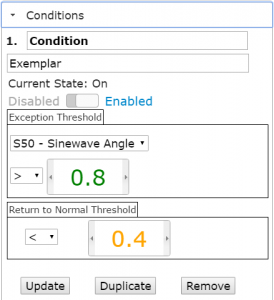 If you click the Conditions option you will see there is a sample condition provided, which operates on the sine-wave virtual sensor. Enable this condition, and click the Update button to save. Events should now start appearing in our event queue. Well, there are 2 ways. The Statistics page has a useful table showing the last 10 events. They will be listed as unprocessed at this stage, as we haven’t installed the rules engine, but you should see them appearing as set/reset pairs. The table is fine for administrators, but we really need a better visual display of our conditions and events, to confirm the logic is meeting our requirements. This is an invaluable tool for checking and adjusting your condition expressions to get the correct outcomes. 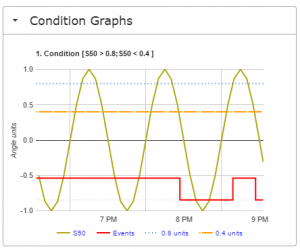 The example condition is a slightly unrealistic scenario, in that we are not switching anything from our events, and so the sensor values do not respond, but shortly we will address that. We are tantalisingly close to closing the control loop. All we need is to link our events to actuators. This is accomplished with Rules and Actions. These are described in the next post. 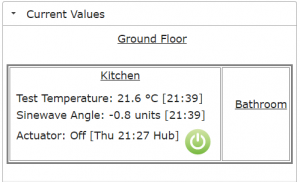 The statistics are very useful when configuring sensors and setting up your hub, but for daily use we need a more contextual presentation of temperature readings, etc. Now you can refresh the website in your browser and choose the Current Values option. All Sensors, Actuators and Impulses are assigned to a zone, and will be displayed within that zonal box in this floor plan representation. 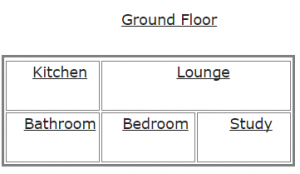 You will want to make your display mimic the layout of your house, as far as possible. In the next post we will enable sampling, and see our sensor values displayed on a graph. Now we have a working controller we need a better user interface to enable us to add sensors, modify zones and perform all of the configuration. 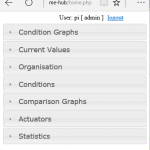 The hub website uses Google Charts for graphs, and also employs an Org Chart for the Organisation interface. This is more touch-friendly than a table. Unlike the controller, the website will dynamically update, so you should be able to login, choose the Organisation menu option and view the Zones, Sensors, etc. At this point, you may want to create a new temperature sensor and restore the virtual sensor that we hijacked for testing. Within the edit forms there is a Duplicate button for all organisation objects, so it is very easy to clone sensors, actuators, etc. While we are doing some administration, we can setup some sensor alerts. This is described in the next post. Right, let’s get some code for our website. The following wget shell command will fetch the files for a skeleton website from the project’s code repository, and place them in your html web content directory. The Statistics page provides tables of technical data such as sensor values, actuator states, alert states, maximum/minimum values, queued messages and system information. We have implemented this first, so we have a simple view of our sensor values, but there are many other ways to view data which we will implement in later posts. The skeleton database has one sensor pre-configured, the Sinewave Angle virtual sensor, but as we have no controller software running it is stuck at its last reading. This is our next task. The website database access will be performed by a shared script, hub_connect.php, in the /var/www/private_html directory. This script has login details, so is placed in a new directory outside of the publicly accessible directory tree. Now we can test the database access from a PHP script, but first we need to enable Display Errors . Place the following script in the /var/www/html directory. This completes the setup of the core hub components. In the next post we will consider the plan for the remaining parts of the project. and create and edit files in the html document root. The next task is to install PHP, PEAR, MDB2 and MDB2 pgsql. The best way to check that PHP is correctly installed is to create a small script, info.php, that runs the phpinfo() function and place it in the var/www/html directory. Browse to this page and if PHP is working you will see a long list of details about the installation. If all that checks out we can move on to testing database access from our website.